For some now, God has laid it on my heart to do a series on success principles … not what you’re thinking … To look at great men and women, especially of the Bible, and in particular, the Old Testament … What principles, characteristics, did they share? What can we learn, and apply, from what they learned, and applied? There’s an old saying that, to be successful, you look at what successful people are doing, or have done, and you do the same thing. “Copy them” would be another term that comes to mind. I have learned that if something is “an old saying,” there’s a reason it’s still around. Aren’t we supposed to “be like Christ?” Our goal should be to know Him first, and then make Him known to others. I’ve also learned that every “success principle” has its roots in Scripture. Man has taken it, changed it, used it, but these principles haven’t changed. Faith, humility, courage, obedience, perseverance, patience, they listened, and they spoke boldly. These were real people, who had real lives. They had emotions, thoughts, and feelings. They faced great challenges-and disappointments. They experienced great victory, and great loss. They had family, friends, and enemies. They were surrounded by sinful people, and so often, a sinful nation. They were persecuted for their faith. They were mocked, made fun of-all the way up to imprisonment and death. They faced the loss of their family, their property, their status (Oh No! Not That! ), even their lives. The more I write, the more I realize that they were just like us. That’s quite a list. Yes, I want to be like Jesus, but He has given us others to learn from. I will always urge you to read your Bible: To pray more, read more, be more. I’ll never forget when, years ago, Carol was reading the Old Testament, when she was approached by someone who asked her, “What are you reading that for?” This was meant in reference to reading the Old Testament, in favor of the New. I have just finished a series of character studies on those great Old Testament saints. I am so glad we have them, and their stories, for our examples. After all, that’s exactly why they were written. I’ll never forget, one day, I was reading to a boy, probably 8-10 years old, who I can honestly say had never been to church once in his whole life. I just happened to have a “Children’s Bible Story” book on the bookshelf, and I read him the story of Daniel in the lion’s den, and then story of Shadrach, Meshach, and Abednego. His eyes were as big as saucers; he was speechless, as he hung on every word, on the edge of his seat. Did I mention he had never been to church before? His reaction to the stories were the same as mine, when I read them again, only recently, and Carol’s reaction today. They were “set apart” to “play a part” in God’s plan. I’m so glad they were, and that we have God’s Word to learn about them, and from them. “He came to drag us away from certain destruction. He came to save us because there is no other way. Please enjoy this post from “A Devoted Life” Blog. “A LIFE-RING ON A SINKING SHIP” – Feb. 21 | A DEVOTED LIFE. Tagged Christian life, ministries we support., words for daily living. We want to share with you “The Eagle Still Flies (Under Star Spangled Skies),” A New Anthem For America, which was written as a Memorial after the events of September 11, 2001. Now, even though it is years later, recent events remind us of how precious our liberty and freedom are, and how much what really makes America … hasn’t changed. “All Americans were deeply affected by the events of September 11, 2001. We celebrate the efforts of a nation that is not joined because of the event, but a nation that was joined before the event. We commemorate, remind, honor, and celebrate all that this nation represents-before, during, and after the events of September 11. The true heroes and hope of America-who came to the forefront before that day, on that day, and on each day thereafter. This poem is very personal, for I love New York, and I love America. I can’t envision one without the other. The city, like the country, is not comprised of boroughs, but brothers. We wish to pay special honor to the men and women who are proudly serving America in the Armed Services, and offer this poem to bring hope, comfort, and pride to all Americans. Everywhere. While Titanic Sank, John Harper Preached – 1901-2000 Church History Timeline. 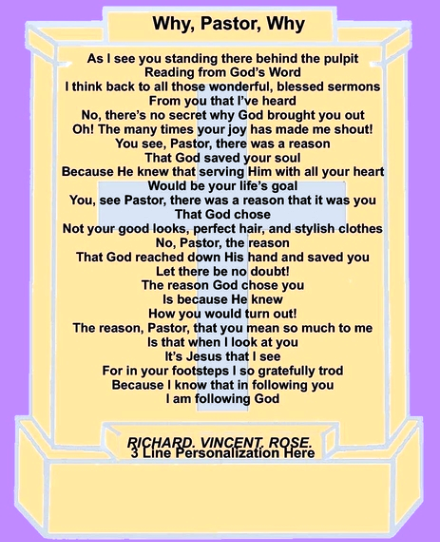 “WHY, PASTOR, WHY™” is a poem specifically purposed to uplift and encourage Pastors. Many times, I have heard the startling statistics of the number of Pastors who are leaving the ministry. We as Christians can forget how we were before the Lord “called us out,” how much He has done for us, and how many lives we have affected through our faith. How much greater the burden must be for these men and women who devote their lives to the Gospel. They must “keep on keeping on!” Not just for themselves, but for the lives they touch. The call is not just for them, but for their flock. I firmly believe that God wishes to give this message of encouragement to all pastors, and their congregations, world-wide. As Pastor Dan delivered these sermons, entire congregations were constantly held in awe as the words seemed to flow from the very heart of God. Gazing down from the sound board, I heard Pastor Dan discuss the awesome grace, and mercy, of God, as the Pastor humbly shared how he did not know, nor could even understand, how God could reach down and save him from Hell, after all he had done in his life. Why, Pastor Dan confessed, he did not even deserve to carry water into the sanctuary, to even be a water boy for the church. No, Pastor Dan could not understand why God loved him so much, and then to allow him to serve as Pastor, was even further beyond his comprehension. Later that night, after returning home, I pondered Pastor Dan’s questions about “Why?” Then, the Lord spoke to me, and told me “Why.” Jesus answered the Pastor’s questions, clearly writing them on my heart. The words came as fast as I could hastily scribble this direct revelation, on a yellow legal pad, as I sat at the dining room table. It took me 10-15 minutes to write “Why, Pastor, Why,” as the words just flowed from my pen as fast as I could write. I also realized, as I looked at the written words, that what God had revealed to me about my Pastor … the same statement should be made about every Pastor-yours and mine. He further revealed that His answer applied not only to Pastor Dan, but to all Pastors. Then, He directed me to reach all Pastors with this simple message. Allow me to close with this note: When I was given the poem, I didn’t even have a typewriter; I had to borrow one from a church family. I didn’t have a computer, so I had to make copies at the church. When I wrote the poem, God made very specific promises to me about the poem. I mention this to make the point that God is faithful to His promises. It is ok to remind God of His promises! It is not Him that will ever forget: You should remind God of His promises so that YOU won’t forget! How could God allow me … yes, me … to encourage and minister to Pastors? God’s grace, and mercy, is limitless. We are beginning what will become a regular feature of our Blog, featuring the writings of Richard.Vincent.Rose. Of course, we must begin with “Why, Pastor, Why,” which was the foundation of our Pastor Appreciation Gifts online store, and, most certainly, this blog which followed. “We understand the deep love, admiration, respect, and appreciation you have for your Pastor. How do you put into words, your appreciation for someone who has given, and sacrificed so much? In a way which can’t be explained, only felt, the Pastor poem WHY, PASTOR, WHY™ reaches the depths of your emotion-and your Pastor’s-to put these very emotions into words. This is why we feel that this is the definitive Pastor appreciation poem. It speaks to why your Pastor was chosen, and why your Pastor means so much to you. WHY, PASTOR, WHY™ matches our commitment to honor, uplift, edify, and encourage Pastors to continue their life’s work and calling. Oh! The many times your joy has made me shout!!! Let there be no doubt! How you would turn out!